Bo Chen obtained his B.S. at University of Science and Technology Beijing in 2006, and Ph.D. at Shanghai Institute of Organic Chemistry in 2011. After a postdoctoral appointment at the University of North Texas from 2012 to 2014, working with Professor Weston T. Borden, he is now a postdoctoral research associate at Cornell University, in the group of Professor Roald Hoffmann. 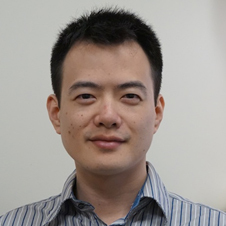 Chen is a computational organic chemist, and his research focuses on the effect of pressure on organic reactions in fluid and solid-state phases, the mechanism of benzene nanothread formation, the reactivity of diradicals, and computational investigations of negative ion photoelectron spectroscopy. 1. Chen, B., R. Hoffman, and R. Cammi, The effect of pressure on organic reactions in fluids - a new theoretical perspective, Angew. Chem. Int. Ed., in press. 2. Bai, D. C., F. L. Yu, W. Y. Wang, D. Chen, H. Li, Q. R. Liu, C. H. Ding, B. Chen, and X. L. Hou, Palladium/N-heterocyclic carbene catalysed regio- and diastereoselective reaction of ketones with allyl reagents via inner-sphere mechanism, Nature Comm. 7, 11806 (2016). 3. Chen, B., R. Hoffmann, N. W. Ashcroft, J. V. Badding, E. Xu, and V. Crespi, Linearly polymerized benzene arrays as intermediates, tracing pathways to carbon nanothreads, J. Am. Chem. Soc. 137, 14373-14386 (2015).